The process of cooking food quickly on a high heat setting in order to create a thick, flavorful crust on all of the surfaces of the items being cooked. 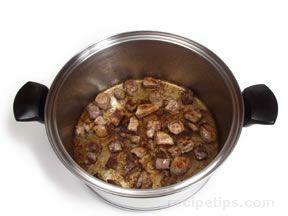 In order to brown food, such as meat, a small quantity of oil is added to a skillet over high heat and the meat is quickly seared on all sides to add color to the surfaces. This process keeps the meat tender without overcooking the interior of the meat so that it retains a pinker color. This is especially beneficial for foods that will continue to cook with a second cooking method, such as braising or stewing. After browning meat, small particles of the meat remain in the pan, which are used to create a "fond" that can be deglazed to provide additional flavor to the food being prepared.